Content is at the heart of everything we do. In today’s digital age of communications, creating and publishing content which is of interest and value to your audience is the most cost effective and efficient way to tell your organization’s story. We create high quality, affordable content to help our clients tell their stories. Over the years media has changed. The digital age has broken down the walls between the silos of paid, earned, owned, and shared media. Today, there is simply media. And with the average person receiving thousands of brand messages a day, what separates successful media from the pack is engaging content. In a world where we can no longer simply blast messages through traditional media, people now need to decide to come to us. We start with your audience and build the content they would actually like to experience and build relationships. With a clear understanding of what story you want to tell, we provide the right mix of messaging, content ideas and types of content to ensure that your organizational goals and objectives are met. 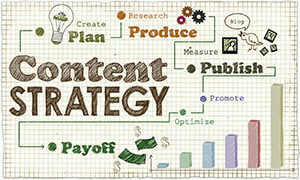 Our content marketing campaigns are process-driven and metric-focused. As a part of our effort, we create a content marketing process, dashboards, content calendars and analytics tools that encourage collaboration, automation and new ideas for content. Our agency’s experience in content marketing ensures that the programs we provide are the best fit for the clients’ resources and organizational goals.